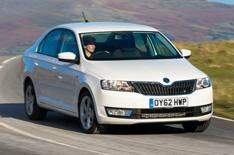 2012 Skoda Rapid review - updated | What Car? The Skoda Rapid is a new small family car from Skoda, sitting between the Fabia and Octavia in the brand's line-up. However, it's much closer in size to the larger of those two cars; in fact, it's 30cm longer than a Volkswagen Golf. What might also surprise you is that, although the Rapid looks like a saloon, it's actually a hatchback, with the emphasis on space as much as it is on low prices. There are four petrol engines to choose from: a 1.2 with 74bhp, a turbocharged 1.2 with 85bhp or 104bhp, plus a 120bhp turbocharged 1.4. The only diesel engine at launch is a 104bhp 1.6 TDI. What's the 2012 Skoda Rapid like to drive? We've tried all but the entry-level 74bhp 1.2, which we expect to be too gutless to comfortably haul around such a large car. The 85bhp 1.2 is hardly quick, either, but it has just enough go and keeps the price appealingly low. The 1.6 TDI diesel is a bit flat below 1500rpm and suffers from a fair amount transmission shunt when trundling along in slow-moving traffic. However, it picks up well in the mid-range and is happy to rev towards the redline. The 104bhp 1.2 TSI petrol feels every bit as keen when you get a few revs on the counter, and it's a good deal quieter and smoother than the diesel. It's a great choice, but pushes that all-important purchase price up. The 1.4 TSI will be a less common sight because it's relatively expensive. That said, it's a fine engine and pulls strongly across a wide rev range, while the standard semi-auto DSG 'box swaps smoothly through the gears. Whichever engine is under the bonnet, the Rapid feels reasonably sure-footed, but it doesn't have the agility of a Ford Focus or VW Golf hardly surprising given that it's a considerably bigger car. The back end can feel rather light under hard braking and the Rapid is reluctant to turn into tight corners. The front tyres squeal surprisingly early, too, but body roll is well controlled. The downside is that this control has been achieved by relatively firm suspension settings, and the ride on UK roads is a little unsettled. Still, the light steering and good visibility to the side and front (if not the rear, where the high bootlid restricts your view) make it easy to manoeuvre, and the Rapid sits securely on the motorway. Only the relatively large amount of wind noise disturbs your otherwise calm progress. What's the 2012 Skoda Rapid like inside? It's inside where Skoda's cost-conscious development is most obvious the simple appearance and back-to-basics nature of the cabin see to that. However, what the cabin also demonstrates is that there's a difference between being cost-conscious and feeling cheap, because despite the wide use of hard black plastic, occasionally flimsy/flexible materials and odds and sods from other VW Group models the last thing the Rapid looks and feels is cheap. In fact, if you avoid the all-black interior and choose some contrasting colours on the dashboard and doors, the cabin is a smart, classy space. There's certainly no faulting the layout of the controls, the amount of stowage up front or the fine driving position, which is achieved by combining a reach- and rake-adjustable steering wheel with generous head- and legroom. However, it's the space in the back that will really impress family-car buyers; not only is access to the rear seats excellent, there's as much legroom as there is in the largest small family cars, and only passengers over six feet tall will suffer from any shortage of headroom. To cap it all, the boot is huge, and is accessed through a high-opening, wide tailgate. Never mind it being bigger than a Focus's, it's bigger than a Mondeo's, and we have only two quibbles: first, the 60/40 split rear seats don't fold completely flat because the bases are fixed; and, second, it's quite a drop from the sill to the boot floor, making it awkward to load and unload heavy items. There are three trims to choose from: S, SE and Elegance. All models get remote central locking, curtain airbags, daytime running lights and electric front windows. SE trim adds 15-inch alloys, air-conditioning and Bluetooth. The range-topping Elegance models gain 16-inch alloys, front foglamps, cruise control, and rear electric windows. If space and value are key priorities, the Rapid deserves serious consideration. However, only the cheaper versions make any real sense; the range-topping models are too pricey. That's why our favourite version is the 1.2 TSI 86 S, which costs 13,700. That said, if you're a company car driver you'll probably want to wait for the GreenTech version, due early next year. This will emit 104g/km of CO2, which means relatively low monthly tax bills.